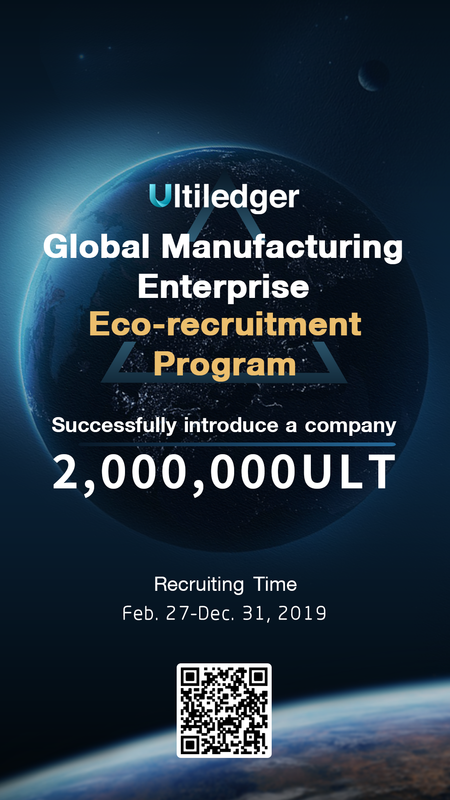 Ultiledger starts a global manufacturing enterprise eco-recruitment program in the communities. Introduce one or more global manufacturing companies, and once Ultiledger signs the contract with the company, you will reward 2 million ULT. 2) Contact person: company’s chairman, executive president or chief financial officer. 1) Community members only need to help Ultiledger to establish contact with qualified companies. After review by Ultiledger team, we will arrange a special person to negotiate specific business with the company. Once Ultiledger signs the contract with the company, the community members will be rewarded. 2) Community members are also welcome to participate in Ultiledger’s negotiations with the company and additional appropriate rewards will be provided. Ultilegder, the Next Generation Global Self-financing Blockchain Protocol, aims to build an economic and financial ecosystem based on token ULT to help any organization (contains government, business, industry clusters or individuals and communities) that needs to build trust at a low cost and rapid construction of a distributed financial book and account system of bank-grade security; zero-cost transaction settlement within the ecosystem. At present, the Ultiledger ecosystem has been applied in the field of supply chain finance, and it has been innovated in the wave of blockchain. The Ultiledger sub-chain has successfully applied in many domestic listed companies, including the Daoen Group (002838), the ST&SAT (002291), and the 365 Group.